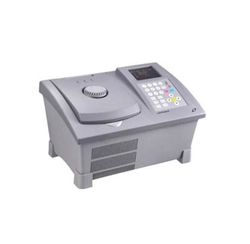 Non-Gradient Thermal Cycler with adjustable pressure hot lid, to prevent volatilizing and dewing. Heat lid with pressure alarm device, to prevent damaging test tube by too much pressure. Adjustable pressure hot lid to prevent volatilizing and dewing. Heat lid with pressure alarm device, to prevent damaging test tube by too much pressure. Convenient and flexible module replacement mode. Innovative module wire socket design achieves module replacement without wire. The unique left-right design for amplification area and operating area. A colored and wide screen displaying Multiple details. Perform 20000 times non-breakdown operation.